Music and mathematics go hand-in-hand especially when it comes to songs that drive a message about the relevance of math in our daily lives. In many cases, music can be helpful in expansion and gaining understanding of math formulas in a way that is just plain fun. Math songs become helpful tools with memorizing formulas and important facts. Chances are you may have heard about the song for the quadratic formula in high school. From zero to infinity, here are the top thirteen songs about math. This music video shows one main character: a girl with purple bows in her blonde hair. She illustrates the versatility of the number 8 in through ice skating. She talks about multiplication involving the number eight. Four times four is the same answer as two times eight. In the last scene, she tells viewers that the number eight rotated sideways is an infinity symbol. This song focuses is all about the sequence of multiplication by the number eleven. When eleven is multiplied by any number less than ten (except zero), it will give you a double-digit number. A mirror is used to demonstrate this. For example, eleven times four is forty-four. This song takes viewers on a journey of multiplying numbers by three. The music video identifies shapes with three sides including the tripod, tricycle, and triangle. In one scene, football players appear with jersey numbers matching multiples of three, from three to thirty. One dozen eggs is the equivalent of three times four. This video ends by showing a happy family of three: a man, a woman, and the child. 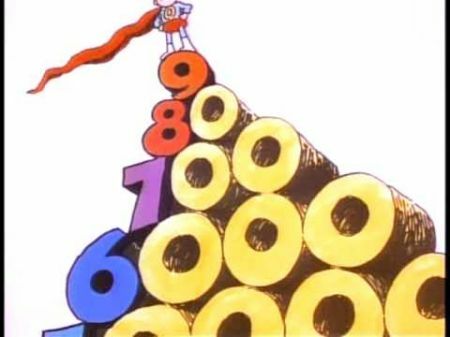 This music video demonstrates the unique quality of zero as a multiplication number. The story begins with a conversation between a little boy with blonde hair and a girl with red hair. The boy talks about his heroes from astronauts and athletes. He dresses up as a superhero with the number zero on his suit. Zero helps scientists “reach the stars” and calculate digits that are closer to infinity. Jonathan Coulton sings about geometry on this track. The song is named after geometry pioneer Benoit Mandelbrot. Coulton tells the story of Benoit Mandelbrot, and the formula for the Mandelbrot Set. This song is featured in Forbes’ Geek Playlist: Math Edition. Musical ensemble They Might Be Giants performs “Infinity" in this music video.This is a song about counting numbers from one to infinity. In this song, the lyrics tell the story that infinity is very hard to reach. The song ends with the message that infinity can't be reached. Tom Lehrer’s satirical lyrics in “That’s Mathematics” describe the connection between mathematics and tasks that people do on a regular basis. He sings about counting sheep when trying to go to sleep, counting money, and measuring ingredients when cooking a recipe. Lehrer sends the message to listeners that math is very important to complete simple to complex tasks in our daily lives. “Naughty Number Nine” is a jazzy song about showing how to multiply by the number nine. In this animated music video, the lyrics illustrate the versatility of the number 9. One lyric talks about how the number ten is nine minus one. This music video features a fictional superhero with twelve toes on each foot and six fingers on each hand. The music video tells the story of the number twelve as it is multiplied by numbers from one to twelve. This video ends when the fictional character flying away on a lightning-fast UFO. In this music video, a teacher and a group of students go on a field trip to the zoo. The story takes listeners and viewers on a journey exploring the number four and multiples of 4 through animals at the zoo. The list of four-legged animals include the lion, tiger, cat, dog, hippopotamus, elephant, and gazelle. “Elementary, My Dear” tells the story of Noah’s ark from the point of view of a little boy. The song begins after the little boy asks his father how many animals were on the ark. It moves forward to explore pairs of two. The song illustrates animals multiplied by two in order to create pairs. “Fives (Here I Come)” is a music video that tells the story of multiplying by the number five. In this song, kids count by five to multiply numbers using their hands. The video shows that five times twenty is one hundred, which equals one dollar. One dollar is equivalent to the sum of twenty nickels and so on. This is a classic song by Bob Dylan. “Love Minus Zero/ No Limit” is a love song that seamlessly blends in the relationship between mathematics with romance. According to Bob Dylan, the song title is a fraction and the formula for a good relationship. In this song, Dylan sings about a love greater than all things money can buy. This song describes an unlimited love that lasts forever like infinity.